This "Historically Speaking" column was published by the Exeter News-Letter on September 23, 2016. Every four years we endure the onslaught of presidential campaigns, and every four years we declare this one to be the worst ever. The candidates are the worst ever. Politics has never been so bad. The only people not convinced of this are historians – because we see the long view. As crazy as recent decades have been, previous ones have also been crazy. It might be best to stop reading or listening to any political commentary that purports to label this election as insanely unique unless it includes the modifier “in our lifetime.” Unless one of our modern candidates publicly accuses the other of cannibalism, they aren’t even coming close to our great-grandfather’s campaigns. In the collections of the Exeter Historical Society there is a folder of political campaign ephemera from bygone years. There are handbills and posters that were used to remind voters (and here, remember, read “Men”) of their civic duty. 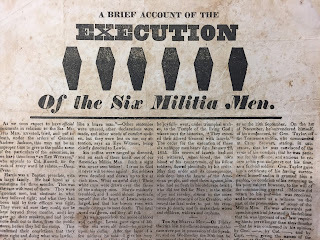 Also in the stack was a scary looking broadside with the title “A Brief Account of the EXECUTION of the Six Militia Men” illustrated with six stark coffins. With all the appeal of a Halloween decoration, this document had no explanation in our records. Turns out, it was part of one of the most notorious elections of all time – the election of 1828. 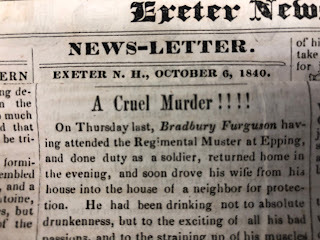 Frequently called the dirtiest campaign, it was described by New York Magazine in 2012 as “The Tsunami of Slime Circa 1828.” The existence of a coffin handbill in Exeter proves that we participated. Why all the animus? We really need to start in 1824. The campaign of 1824 was fierce, but relatively polite. There were four candidates running in the general election. John Quincy Adams, Henry Clay, William Crawford and Andrew Jackson – the hero of the Battle of New Orleans and Senator from Tennessee. Jackson won both the popular vote and the electoral count, but with no candidate receiving a majority of electoral votes the election was thrown to the House of Representatives. Jackson thought he had it in the bag. But after the fourth-place candidate Henry Clay was tossed off the ballot, he threw his support to Adams, who then rewarded Clay with the position of Secretary of State. Enraged, Jackson and his supporters, the Democratic-Republicans, called it the “corrupt bargain” and vowed to get even. 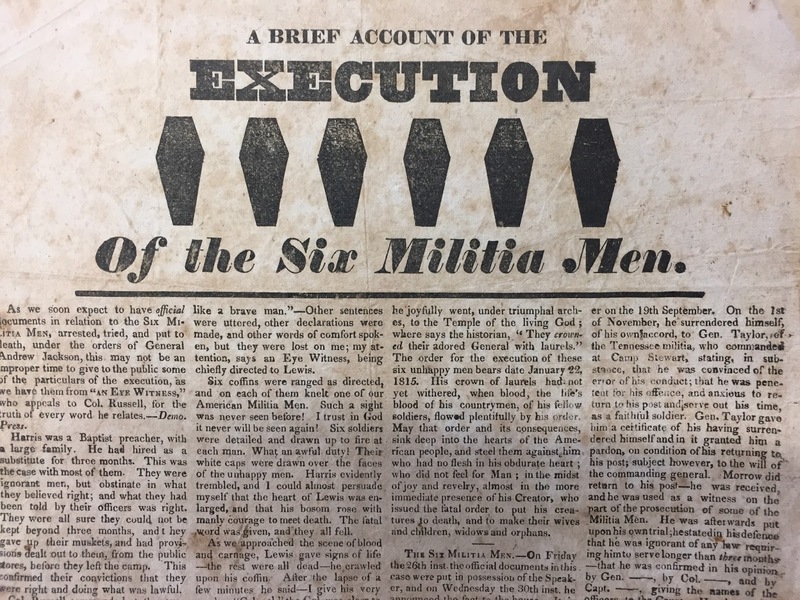 Another of the coffin handbills, not in Exeter’s collections, goes on to relate other Jackson acts of cruelty, including the massacre of Natives in 1814: “these poor wretches were massacred in cold blood, without the least provocation.” After which, he “laid down composedly, and slept upon the field, surrounded by five hundred and seventy dead human carcasses!! !” When morning arrived, “Jackson began again to show his cannibal propensities, by ordering his Bowman to dress a dozen of these Indian bodies for his breakfast, which he devoured without leaving even a fragment.” Jackson was further accused of adultery and his wife of bigamy due to a slight legal kerfluffel forty years earlier. 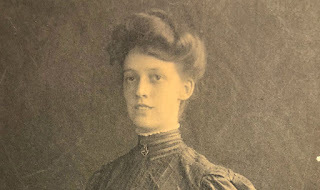 Jackson’s wife, Rachel, had thought herself divorced from her first abusive husband when she married Jackson. The oversight had been quickly corrected, but the mud-slinging accusation gave the impression of Jackson as a complete hick. In reality, he was the wealthiest man in Tennessee with extensive slaveholdings. Negative campaigning is used, we hear, because it works. It didn’t work, however for John Quincy Adams. New Hampshire supported him, but most of the rest of the country still felt he’d stolen the election of 1824. In that earlier election, the Rockingham Gazette had lamented, “a foreigner, who has traced the progress of the controversy for the last year, through its interminable array of newspapers, hand-bills and pamphlets, could form no other conclusion, than that the people of these States had been seriously discussing the respective merits, and settling the comparative claims to office of gamblers, murderers, swindlers and hang-men.” Add pimps, cannibals and adulterers, and you may just have a perfect assessment of the election of 1828. Picture: Exeter Historical Society's notorious "coffin handbill" from the archives. Anti-Jackson negative campaign ad from the election of 1828.